Ready or not, here comes another Marvel Legends Build-A-Figure wave. I've seen reports on the internet that they are at retail now, though stores may vary as a trip to my local Target yielded nothing. Collect all 6 and build the giant Red Hulk who looks really pissed off even by Hulk standards. Keep your eye open for the Wolverine variant chase figure in his X-force uniform. But remember, these are all Target exclusive so don't be lookin' at Walmart. 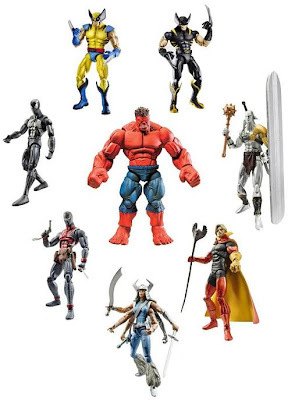 I'm not a huge Marvel fan, but I like the Silver Savage and will maybe pick that one up if I ever come across it. UNION JACK! I gonna get in line right now...!